Hunted: The Demon's Forge is an unforgettable cooperative action game, pitting you and your partner against waves of vicious enemies. Hunted: The Demon's Forge is an unforgettable cooperative action game, pitting you and your partner against waves of vicious enemies. 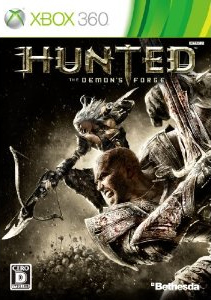 Features Dark Fantasy Shooter: Powered by the Unreal 3 engine, the world of Hunted comes to life in a third-person dungeon crawl with the intensity and action of a modern-day shooter. .. The 21st-century remake of the classic franchise in HD. In Choplifter HD, players take on the role of an up and coming rescue pilot asked to join the elite, international helicopter rescue team. Pilots will be trained to command a variety of helicopters with offensive capabilities including missiles and mini-guns, as well as a very vocal co-.. Vault 101 – Jewel of the Wastes. For 200 years, Vault 101 has faithfully served the surviving residents of Washington DC and its environs, now known as the Capital Wasteland. Though the global atomic war of 2077 left the US all but destroyed, the residents of Vault 101 enjoy a life free from the constant stress of the outside world. Giant Insects, .. The Elder Scrolls V: Skyrim is the next installment in the award-winning Elder Scrolls series. Skyrim is the follow up to the 2006 Game of the Year, The Elder Scrolls IV: Oblivion and the next game from Bethesda Game Studios, creators of the 2008 Game of the Year, Fallout 3. .. RAGE is an action game set in a post-apocalyptic landscape jam-packed with driving and shooting, created by John Carmack and the rest of the Doom crew. RAGE features intense first-person shooter action, breakneck vehicle combat, an expansive world to explore and jaw-dropping graphics powered by id’s revolutionary id Tech® 5 technology. S.. Brink is an immersive shooter that blends single-player, co-op, and multiplayer gameplay into one seamless experience, allowing you to develop your character across all modes of play. You decide the role you want to assume in the world of Brink as you fight to save yourself and mankind’s last refuge for humanity. Brink offers a compelling mix of dy..
What's the 2009 Xbox 360 Game of the Year?